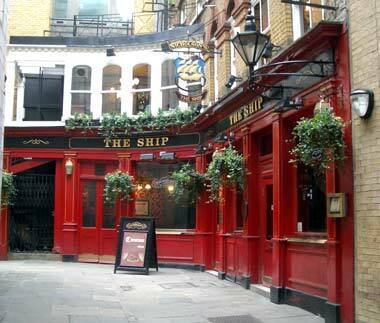 Tucked away from any possible passing tourist, The Ship is a lovely City pub. Talbot Court is a pedestrian walkway just off Gracechurch Street, on a nice day (which simply means it's not raining) you will find a good deal of The Ships clientele here, even when the weather is cold, there is gathering outside. Inside you will find a small well stocked bar, traditional wooden floor and plenty of bar stools to perch on. On our visit there was; Youngs Bitter, Tribute and Mod Bob from the Nethergate Brewery which is close to my heart. A tavern stood in Talbot Court prior to the Great Fire of 1666; the name Talbot, comes from a huge dog used from hunting. The Ship is located very close to the entrance to the long since gone Herb Markert, which were part of the Leadenhall Markets along with Fish and Flesh, which existed here in 1754.